There wasn’t much in Kiowa, Kansas, but in 1891 there was a notorious murder in a saloon where Cora Isabel Bennett found it necessary to murder her lover, William (Bill) Morris; and there was Carrie Nation. Carrie Nation puts the 1891 murder into perspective in Chapter 6 of “The Use and Need of the Life of Carrie A. Nation" penned in 1906. "There was a saloon keeper in Kiowa, named "Billy" Morris and living with him as his wife was a girl whose name was Cora Bennett. This poor girl had been living an irregular life, but was true to this man, who had promised her time after time to marry her, but was only deceiving her. She entered his bar room one day and told him he must fulfill his promise to her now, or she would kill him. He tried to laugh at her. She fired a shot and killed him on the spot; then the poor girl fell on his dead body screaming in a distracted manner." Although, Cora Bennett put Kiowa on the map, it is the destruction of Carrie Nation that the Kiowa people remembered. Kansas was the first prohibition state (1880) and Carrie Nation disapproved of how they were enforcing the law. Abandoning non-violence, Carrie Nation and the Woman’s Christian Temperance Union (WCTU) preferred “hachetation” (as she called it) smashing bars and destroying the saloons. Cora Bennett only served about six months as her verdict was guilty of fourth degree manslaughter, since clearly, the jurors decided, the murder was a crime of passion. 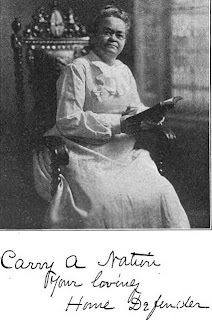 But during these six months, Carrie Nation was the “Jail Evangelist” and befriended Cora in Medicine Lodge, KS, where she was serving her time. "Go to Kiowa, and" (as in a vision and here my hands were lifted and cast down suddenly.) "I'll stand by you." I did not hear these words as other words; there was no voice, but they seemed to be spoken in my heart. I sprang from my bed as if electrified, and knew this was directions given me, for I understood that it was God's will for me to go to Kiowa to break, or smash the saloons." It didn’t take long for Carrie to go to Kiowa as directed by God and assist using hachetation to close the saloons and force them to abide by the Prohibition laws of Kansas. With an unwelcome return to Medicine Lodge, she closed those saloons too while making her way across Kansas. If your ancestor’s saloon went missing during Prohibition, check the whereabouts of Carrie Nation and the WCTU. A good story may be buried there. Note: This story was revealed looking for my William Morris. It is not proven that this Wm. Morris is part of my family tree. But, the researching gave me a memorable story. Thanks for reminding me of a very colorful part of US history! Very interesting. I was just researching Carrie Nation for my webpage about her, when I found your interesting account.